The Horror Digest: Duel: Not the Rattlesnakes! I'll be honest--I was avoiding Duel for a very long time. Mostly because the idea of sitting through an hour and a half of a guy trying to escape from the clutches of a truck didn't exactly thrill me. I knew that it was the made for TV movie that got Steven Spielberg noticed, and that it was "exciting" or something of the sort, but I figured that all that "truck stalking" action wouldn't happen until a considerable amount of time had passed. Turns out--it happens right away! It reminded me of how quickly that first creepy phone call comes in Scream or how quickly that first zombie stumbles into the cemetery in Night of the Living Dead. It's nice to have the action begin so quickly, but because I knew that seeing the truck so early would mean it would be an entire hour and 30 minutes of the same kind of thing, I began to get very worried. As it turns out, Duel is pretty exciting and possibly even a bit nerve racking. Road rage is never a good thing-and I'm sure we've all been the target or possibly the perpetrator in our days of driving. I am willing to bet however that no one was ever stalked relentlessly by a scary truck with questionable motives. Perhaps one of the more frightening things about Duel is figuring out what could have possibly set off that truck driver in the first place. Was it because David Mann passed him? Or because David Mann's red car set off the driver like a matador's red cape sets off a bull (Yes I know a bull is actually colorblind just go with the metaphor mmmk?) Or maybe it was because David Mann's face just kind of annoyed him. The fact that there is no clear cut reason and that we never get to see the truck driver is both frustrating and chilling. 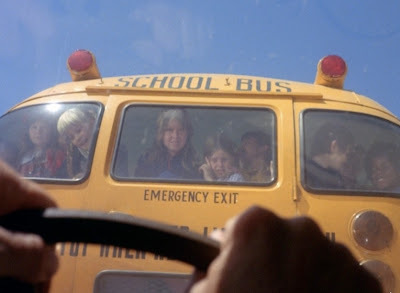 With every scene that David Mann looks in his rear view and sees the truck approaching behind him, we get more and more nervous. 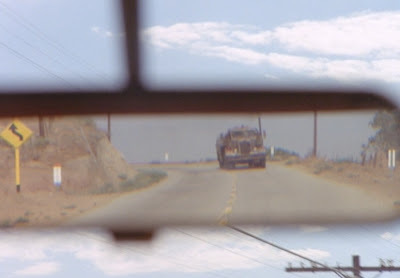 The beauty of it all is- Spielberg-almost in the way that he portrayed fear with just a dorsal fin and/or music, is able to create fear just with that single shot of the rear view mirror. and of course the rattlesnake farm scene were two of my favorites. They both truly showed the massive extent to which this truck driver's balls could swell--imagine almost mauling a man down in a phone booth for no real reason at all? Then we have the diner scene. Even though we are never told or shown who the truck driver is--we all have our assumptions. But honestly, how much more frustrating can you make things? David's inner monologue is panicky, anxious, and paranoid--everything you would expect from someone who almost lost their life for no good reason. So many questions arise in us as we try to place ourselves in the same situation, but it soon becomes quite clear that we could do no better. Plus how completely awesome is that last scene? Not as awesome as David Mann's victory leap, that's for sure. Overall, Duel is a pretty solid film. Sure it gets a little tiring and annoying being trapped in a car with David Mann, whose facial and verbal expressions are almost as hilarious as that little old lady and her wacky snake farm. But in all honesty it was pretty darn good. Maybe not as a feel good horror movie- but of an I'm in the mood for some crazy truck driver shenanigans movie. Great review. Duel is slickly awesome. You should check out Breakdown starring Kurt Russell. Sort of similar movie but with a twist. As one of the older folks in these parts, I can recall watching this on TV when it first came out (it was a made for television film for ABC), and it scared the bejesus out of me. For more early Spielberg, look for the old Night Gallery episode, "Eyes" starring Joan Crawford! I like to think it's David Mann's face that drives the truck driver insane. He sees this mustachioed man in his rear view mirror, with his facial tics, and decides to mess around with him. And honestly, who wouldn't want to mess around with David Mann? I just went to an event all about Jaws and other shark movies, and they talked at length about how basically this movie was almost like a trial run for Spielberg. There are lots of parallels with Jaws. "Duel" is one of my all-time favorites! I actually saw it when it was first aired on TV - it was like an event because the whole family watched it. So scary! And so totally a blueprint for "Jaws." Dennis Weaver was amazing. This movie has also been a source of great fun for me as I have had many debates with those who claim it is NOT a horror film - I say it most certainly is. Spielberg in amazing form here at such a young age - there was this intangible sense of wonder and "awe" inherent in his 1970s and 80s work that somehow disappeared once he got to "Jurassic Park." But "Duel"... WOW! I love this movie! When I saw the newer Joy Ride movies for the first time, I knew exactly where their inspiration was pulled. And the jaded viewer is right, check out Breakdown. I like that movie alot as well. So glad DUEL didn't disappoint you (much) when you finally saw it. 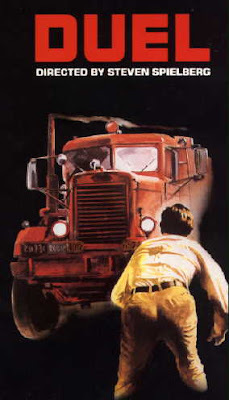 It was a big boost for Spielberg's career, and as several comments pointed out, films like BREAKDOWN (which owes an even bigger debt to Matheson's short story and TV-movie DYING ROOM ONLY) and JOY RIDE were clearly influenced by it; to that list I would add the MAD MAX trilogy and Stephen King's twice-filmed story "Trucks." (He and his son, Joe Hill, recently wrote "Throttle," a story overtly inspired by DUEL.) Matheson's original story was actually inspired by a real-life event that happened to him and his friend and fellow author Jerry Sohl the day JFK was assassinated, when they were similarly tailgated by a demented trucker through a narrow canyon. The JAWS parallel is dead on: Spielberg has acknowledged that when he first read JAWS, he wanted to film it because it was "DUEL in the sea." And, by a curious coincidence, I stumbled across this review while looking at your recent post on POLTERGEIST, which many have observed bears a marked similarity to Matheson's short story and TWILIGHT ZONE episode "Little Girl Lost." For further information, see my book RICHARD MATHESON ON SCREEN, tentatively due out in early October. Brilliant film, I think I may have an irrational fondness for it but for me its ranks as one of my top 10 favourite films ever, sheer tension throughout. The entire cafe scene is just fantastic; I don't normally like internal monologues but David Mann's (thats TWO N's) frenzied attempt at rationalising what was happening to him is brilliant. Spielbeg peaked at his fist attempt. Duel is about road rage. 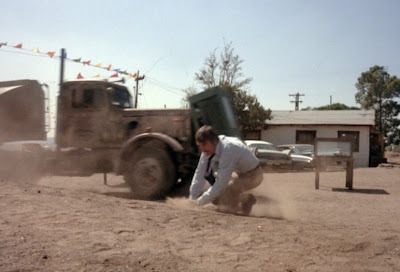 Twenty tons of truck pursue poor Dennis Weaver. In the diner Dennis Weaver starts a fight with a customer thinking that he is the insane truck driver. It turns out hes wrong and its not the murderous truck driver. The evil truck driver isnt shown so we dont know who he is. Another horrific scene is when the truck pushes Weaver's car onto railroad tracks and he narrowly escapes being hit by a train. Watching this makes me fearful of being on the road.